There are also instances when you write pieces that do not need to be edited by a professional, like maybe replying to a fan mail or writing a review on a book. 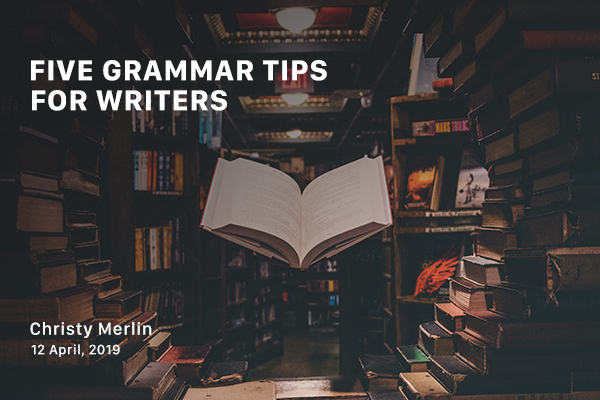 At these times you obviously rely on your own skill, and as an author, you do not want to be caught making a grammar mistake because as I mentioned before, grammar is one of the tools in your arsenal. Obviously, this doesn’t mean that you suddenly have to produce perfect drafts that have zero mistakes, but here are some things to keep in mind while writing editing or rewriting your drafts. Being one of the most commonly used punctuation marks, the comma is also one of the most misused one too. In fact, a whole book can be written on this topic. For now, let’s just look at a few main things we should keep an eye on. When a sentence has an introductory element, word or phrase, a comma should be used. Incorrect: In case you haven’t noticed the banner is blue. Correct: In case you haven’t noticed, the banner is blue. Incorrect: Furthermore it is impossible to deem him guilty with the above evidence. Correct: Furthermore, it is impossible to deem him guilty with the above evidence. In a compound sentence, a comma is used to separate independent clauses. The comma comes after the first clause and before the conjunction. Incorrect: Hari turned the lights on and he sat at the table to work. Correct: Hari turned the lights on, and he sat at the table to work. Incorrect: Mary went to the museum and she went back home from there. Correct: Mary went to the museum, and she went back home from there. The confusion between its and it’s is a major issue that pops up with everyone that writes. To clear it up, its means belonging to and is used to indicate possession while it’s stands for it is. Incorrect: Its extremely humid today. Correct: It’s extremely humid today. Incorrect: The wolf bared it’s canine at the hunter. Correct: The wolf bared its canine at the hunter. A colon is used to at the end of a sentence to define or introduce something. Incorrect: The boy selected: red, blue and green. Correct: The boy selected three colours: red, blue and green. Incorrect: The athletes were from: China, Argentina, and Chile. Correct: The athletes were from three countries: China, Argentina, and Chile. This happens when you place a modifier at the wrong place in a sentence and it is set apart from the word it modifies. A modifier is an optional element in a phrase or clause. It modifies (changes the meaning) of the element it is attached to. However, it can be removed and the sentence will still be grammatically correct. Incorrect: Eldhose found a brightly coloured woman’s purse. Correct: Eldhose found a woman’s brightly coloured purse. Incorrect: Jo had a red girl’s hat. Correct: Jo had a girl’s red hat. As simple as it sounds, this is one of the repeated mistakes. A subject and noun should agree with one another regarding whether they are plural or singular. If the subject is singular, then the verb should be singular; and if the subject is in plural, so should the verb. Incorrect: Divya and Hari has been lying on the mat for three hours. Correct: Divya and Hari have been lying on the mat for three hours. Incorrect: The kitten have been playing with the string since morning. Correct: The kitten has been playing with the string since morning. These are just a few tips that will make a huge difference to your pieces. Having grammar skills will also help you boost your confidence as a writer. I hope you found these tips useful. If there are other grammar points that you think should be included in the list, please leave a comment.